A new fleet of Samsung tablets surfaced on a benchmark site last week, and now we might be getting our first glimpse of the upcoming Galaxy Tab 4. The images were shared on Twitter(s twtr) by the reliable @evleaks, and picture the purported 7-inch tablet in both black and white models. As you can see, the tablet sort of looks like a giant version of the new Galaxy S5. It has the same wallpaper and home button, and I wouldn’t be surprised if it features the same dimpled pattern on the back panel as well. 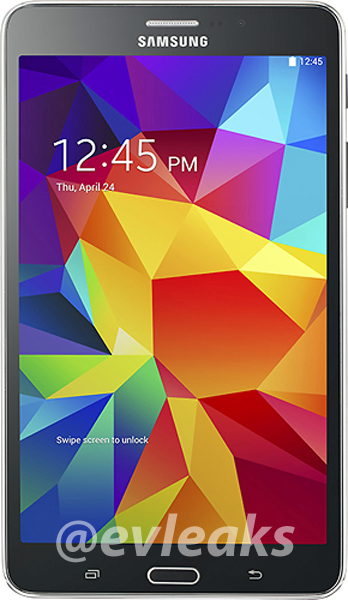 The 7-inch Galaxy Tab 4 is likely to be the entry-level model among Samsung’s upcoming tablets. According to a Bluetooth certification listing, the tablet might feature 1280 x 800 resolution and a quad-core 1.4GHz processor. That should make it relatively affordable, though we won’t know just how well it stacks up to other entry-level tablets until Samsung officially announces it. Well, I guess it’s just a little to big for me.